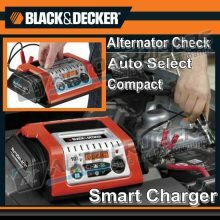 Black & Decker 10 Amp Battery Charger is a simple to use automatic 10 amp battery charger which automatically detects the type and the condition of the battery then chooses the ideal charging rate for the battery. The 10 amp battery charger has a patented alternator check to detect any hidden problems that may cause a flat battery. Even the inexperienced persons can charge their batteries without any problem. Simply select the application and the charger itself selects the optimum settings, with an automatic recognition of the battery size, model and the optimum charging speed. The LC-display navigates through the entire charging process. Safe and intelligent 4-level charging: 1. Battery status check, 2. charging at 80%, 3. safe charging at 100%, 4. Maintenance. Output: 12V DC 10 amps continuous. Automatically selects the charging rate for the type and condition of the battery.